Does a collection a collector make? I don't fancy myself a collector. I used to collect bells, but haven't gotten a new one in years and consider that collection closed. And I sort of collect books. Well, not so much collect as accumulate. I'd never consider myself a true book collector, by any means. Despite not seeing myself as a collector, those who view my holiday decor may very well think otherwise, may possibly consider me a collector. Of Santas. Somehow I've ended up with quite a few Santas. A collection of Santas. Something I never intended to happen. After recently watching a news story of one grandma -- an old grandma, as in 97 years old -- and her collection of hundreds of Santas, my collection has me worried I've entered territory typically reserved for collectors of Avon fragrance bottles and salt-and-pepper shakers. * And that makes me feel old. I must admit though that, age be cussed, I do enjoy putting out for the holiday season all the festive fellas I've collected accumulated. I bought a few of the Santas above myself ... I'd say three, maybe. The rest have been given to me -- by friends, family, former employers. As you can see, their gifts have created quite a display, quite a collection. So does my collection of Santas make me a Santa collector? You be the judge. But in your assessment of me and my Santas, you better be nice ... because Santa's watching! *Nothing against collecting such things, they're just not for me. At all. 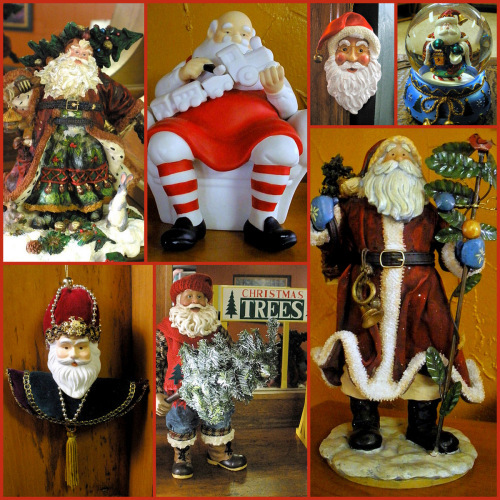 What theme figures most prominently in your holiday decor collection? Angels? Snowmen? Santas? Something unique and unexpected?